Rob Harknett wrote: Did you really fill the gearbox up with oil, or put in the correct amount only? Only up to the level plug. 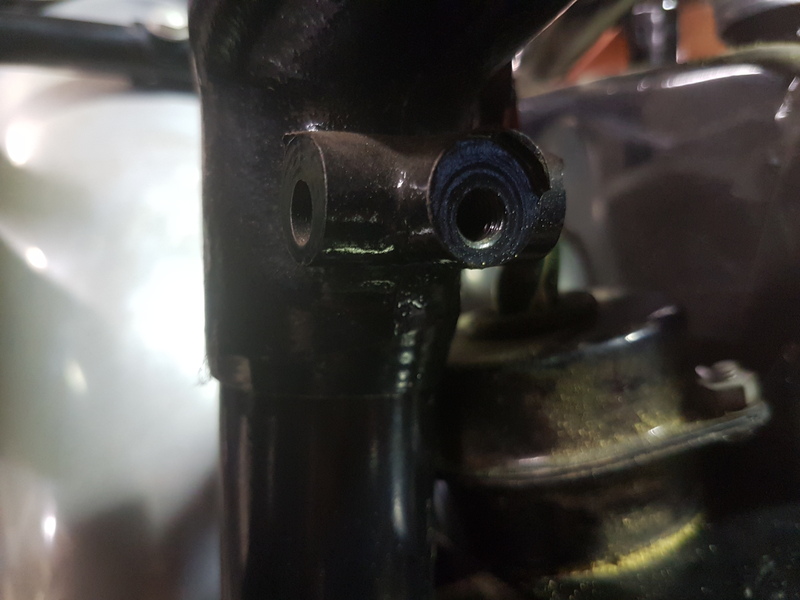 Pictured below, the bottom oil tank mount, there are bits missing, can anyone put me on the right path there? 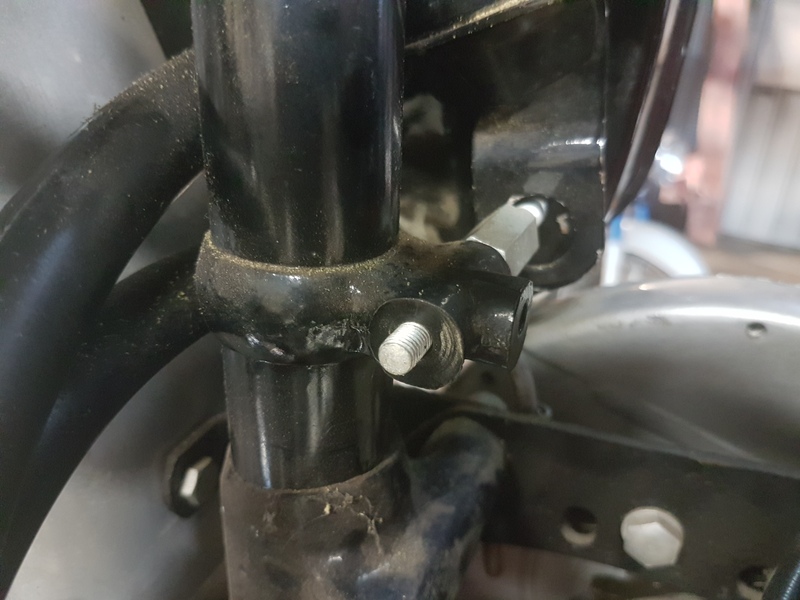 I reckon the upper battery box mount fits to the threaded stud and maybe some sort of large grommet in the tank itself? The forward cast female threaded boss has me stumped. Wonder what fits there? 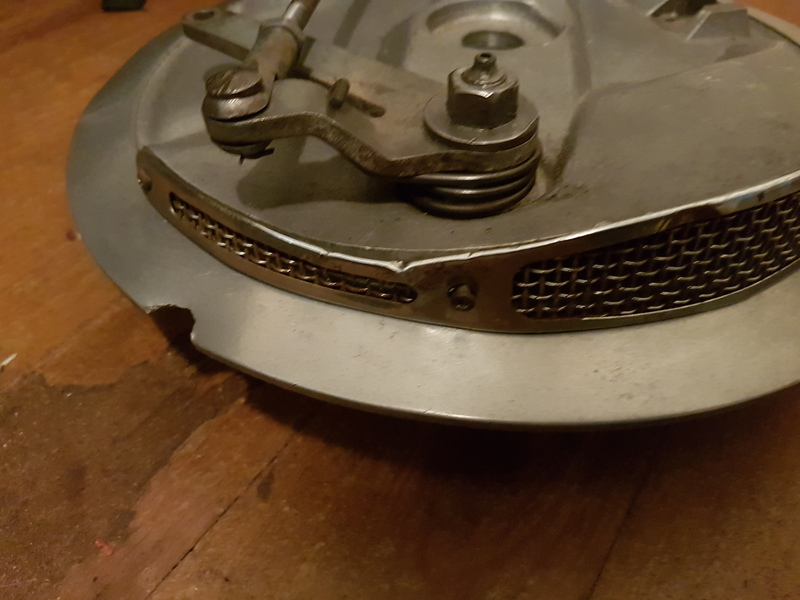 I think it's for a cover plate which fits across the gap between the oiltank and air cleaner. The year before your model it would have been from the R/H oiltank and the toolbox. On the CS it may be a smaller plate, I've never seen one so only guessing, but that's what those threaded bosses were for. Yesterday the Mighty Matchy made exhaust noise for the first time in umteen years. I was a bit concerned as there was no oil return initially. 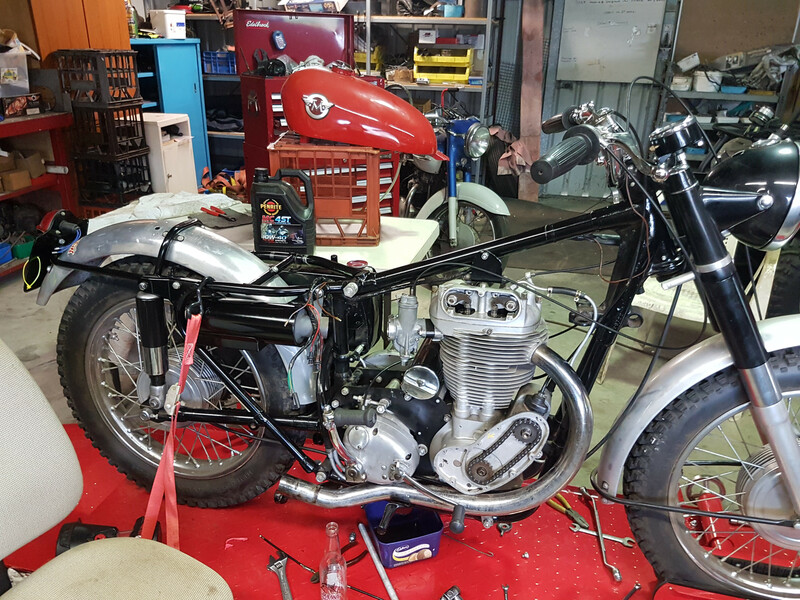 The primary case was open so I removed the spark plug and jury rigged a socket driven by a large electric drill and wound the engine over. I loosened the rocker feed off and in no time oil was coming out there. That was good to see. 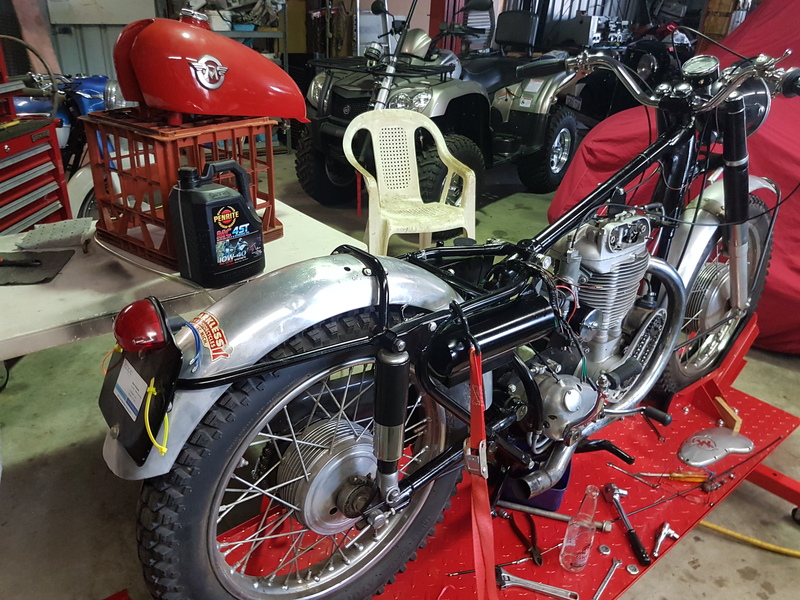 Refitted spark plug and ran engine and soon oil was returning to the tank. So now I will continue on with the electrics, that will be a challenge. I bought this on evilbay, for the T110 in the background and this is how it arrived. Damaged in transit, the pieces were in the bottom of the box. Dunno if it can be repaired or maybe machine it off to remove the flange down to the bottom of the damaged area, not happy!!! The damage could be repaired by gluing the damaged fragment(s) back on using epoxy, 'Metalset' is excellent though I'm not sure if it's easily available, JB Weld would probably work. It won't be invisible but nor will it be as obvious as machining off the damage. Yeah Im a cynic too, already checked that,, the box has a small impct cut in it, right in the right place. The end of the big top frame union stud should have an internal thread on the near side and the light switch bracket bolts there. The boss you were talking about could be for the horn? 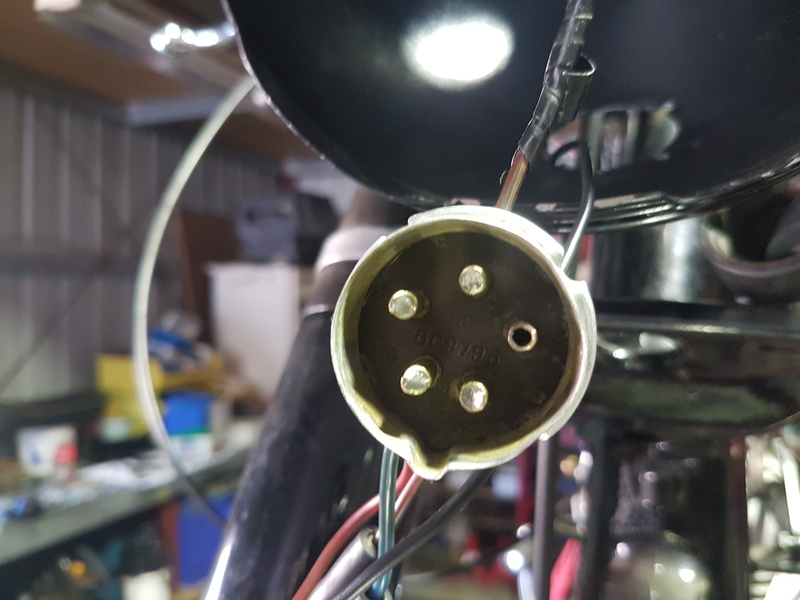 I have been fiddling around with the wiring and below are pics of the headlight socket for the detachable headlight. Does anyone know what terminals on the socket are for what function. I have not been able to track down a wiring diagram for a 1961 G80CS as yet. 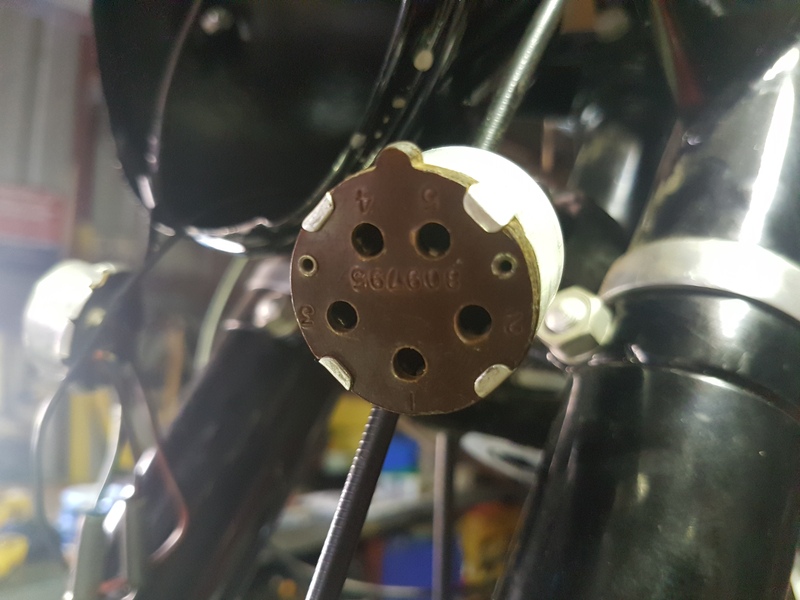 I have found out that the dipper switch is mounted in the headlight shell( I do not have a dipper switch, where to buy one I wonder). There is a wiring diagram for a CS on page 52 of the manual in the attached link. It is for a much later CS but may be good enough. I think this is the dip switch you need. Thanks for that info, I can sort out the wiring now I think. 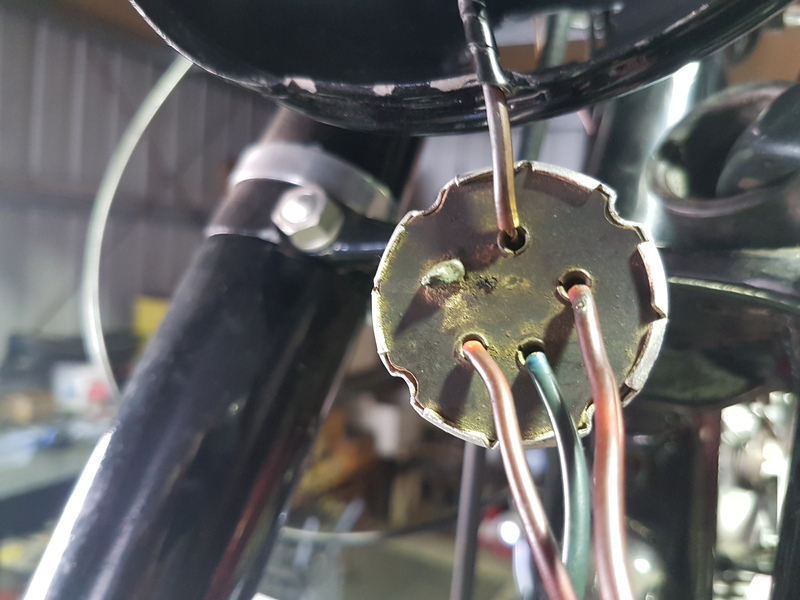 I got a dip switch, Triumph Cub part number 31620 that is supposed to be the same as OEM. I have to go away back to work for 5 weeks so I wont be around, but thanks everyone for your help.